The 37th session of the Intergovernmental Committee on Intellectual Property and Genetic Resources, Traditional Knowledge and Folklore (IGC) is taking place from 27-31 August (IPW, WIPO, 27 August 2018). The 35th and 36th sessions of the IGC focused on genetic resources (IPW, WIPO, 2 July 2018). This week’s 37th session and the three following ones, until the end of the IGC two-year mandate (2017-2019) are expected to focus on traditional knowledge (TK) and traditional cultural expressions (TCEs). Yesterday the two facilitators, Paul Kuruk, vice-chairman, Ghana International Trade Commission (GITC), Ministry of Trade and Industry, and Lilyclaire Bellamy, executive director, Jamaica Intellectual Property Office (JIPO) issued the a first attempt at text revision [pdf] of the initial draft articles on TK [pdf], and the draft articles on TCEs [pdf]. Document REV1 was constructed upon comments made by member states during public sessions as well as informal closed consultations. REV1 presents the preamble/introduction, Article 1 (Objectives), Article 2 (Use of terms), and Article 3 (Beneficiaries) in a table with two columns, one for TK and one for TCEs. IGC Chair Ian Goss specified that the text has no status and is a work in progress. A second version of the document is expected to be produced on the last day of the meeting. The number of objectives in Article 1 has been reduced for both texts to three: a) prevent the misappropriation, misuse, and unauthorised use of their traditional knowledge (and TCEs in the TCEs text), b) encourage and protect creation and innovation, whether or not commercialised, and, c) prevent the erroneous grant or assertion of intellectual property rights over traditional knowledge (and TCEs in the TCEs text). The mention of fair and equitable sharing of benefits arising from the use of TK and TCEs has been removed from Article 1 to be added in the newly designed preamble. The wording “illegal appropriation” has also been deleted, Kuruk said. In Article 2, new definitions of TK and TCEs have been proposed by the two facilitators, with the goal to incorporate the criteria for protection initially found in the initial Article 3 of the TK and TCEs texts. Initial Article 3 (Subject matter of the instrument) has thus been deleted. Reference to a period of 50 years in the terms of eligibility has been deleted, as according to Kuruk, the wording “transmitted between or from generation to generation…” makes it redundant. The definition of TK and of TCEs in REV1 also got rid of the notion of “directly linked” only keeping “linked” with the social identity and/or cultural heritage of indigenous peoples and local communities. This is lowering the threshold, Kuruk said, but leaves adequate policy space to set up higher threshold in national legislations. Bellamy presented a first series of raw preamble paragraphs for TK with acknowledgements, such as the rights of indigenous peoples, regional differences, customary use, the need to respect the indigenous peoples knowledge system, as well as the need to promote creativity and innovation, and the value of a vibrant public domain. The preamble also recognises that new rules and disciplines are needed concerning the provision of effective and appropriate means for the enforcement of rights relating to TK and TCEs. Yesterday, delegates started commenting on REV1, with some countries underlining the fact that their contributions or concepts they are supporting were not sufficiently reflected. The European Union, for example, said it is concerned by the loss of some alternatives and “preferred language” in REV1. Switzerland regretted that the “positive approach” which was in alternative 3 of Article 1 has not been retained. Alternative 3 takes the position that the instrument should support the appropriate use/protection of TK within the IP system, rather than preventing misappropriation. This morning, the EU added that it prefers a measures-based approach rather than a rights-based approach as presented in REV1. Reference in the preamble of mutually agreed terms and prior informed consent would link the potential WIPO instrument to the Nagoya Protocol on Access to Genetic Resources and the Fair and Equitable Sharing of Benefits Arising from their Utilization to the Convention on Biological Diversity, which would be a problem for the EU, the delegate said. This point of view was also expressed by Japan. Yesterday, France gave an explanation of why the country cannot support the word “peoples” which runs against the principles of “indivisibility” of the people of France according to the French constitution. Principles of non-discrimination prevents the recognition of communities, and collective rights of communities based on their origin, culture, language, or beliefs, the French delegate said. If France agreed to the use of “peoples” in the UN Declaration on the Right of Indigenous Peoples that is because it is a political declaration, not a legally binding instrument. If an exception is to be made for a WIPO potential instrument, it would have to be discussed at a high-level negotiating meeting (diplomatic conference), he added. Italy argued that TK and TCEs are “totally different subjects and require different regulations,” and stated that TCEs is a subject already covered by copyright rules. Italy said it cannot support the indication of a right for indigenous peoples and local communities in the draft preamble, and disagreed with the prior informed consent and mutually agreed terms also in the preamble. Since the beginning of this week’s session, committee Chair Ian Goss of Australia has highlighted several points he said were crucial. He engaged delegates to take into consideration the United Nations Declaration [pdf] on the Rights of Indigenous Peoples, as well as other international instruments such as the Nagoya Protocol, and the Swakopmund Protocol on the Protection of Traditional Knowledge and Expressions of Folklore (ARIPO). Goss underlined the imperative need to move on with negotiations in order to avoid the risk of being sidetracked by a growing number of domestic and regional legislations, which are getting ahead of what the IGC is doing. He also stressed the need to ensure that the instrument(s) negotiated at the IGC is/are flexible enough to ensure implementation at national level and provide space for policies already in place. “If it is too prescriptive, we are going to fail,” he said. There is, said Goss, a fundamental conceptual and legal divide between the western norms and laws, and the customary rules of indigenous peoples and local communities. The conception of ownership in the IP system is incompatible with customary laws and systems, and this has to be reflected in any instrument, he stated. Recommendation to the WIPO General Assembly? Delegates have still to agree on recommendations to be made by the IGC to the upcoming WIPO General Assembly in late September. At the start of the week, the chair identified three recommendations as expressed by member states. The first was about progress made in relation to genetic resources. The second was about the maturity of the GR text and whether it would be ready for a diplomatic conference. 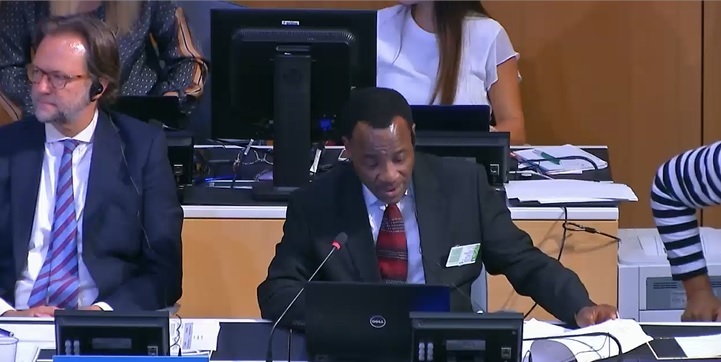 The third was a request from the indigenous caucus that the WIPO general budget provide regular funding for the attendance of indigenous peoples observers at the IGC, instead of relying on the Voluntary Fund, which is now without any funds. Goss said he is preparing a draft text for those recommendations, which he expected will be submitted to regional groups today. "New Document On Traditional Knowledge, Folklore At WIPO; Chair Calls For New Conceptual Approach" by Intellectual Property Watch is licensed under a Creative Commons Attribution-NonCommercial-ShareAlike 4.0 International License.